The stellar epic is as old as our species. The nether worlds and the empyrean sky were discovered by Ice Age shamans and sages stretching from primeval Africa to the islands of the Pacific. Over millions of years of study of the visible heavens and the fact of their own being, they came to an understanding of the invisible truth. Great worlds lay hidden far away, but they impinged on this one through our human nature. We could enter these worlds only after dangerous journeys and in other shapes. 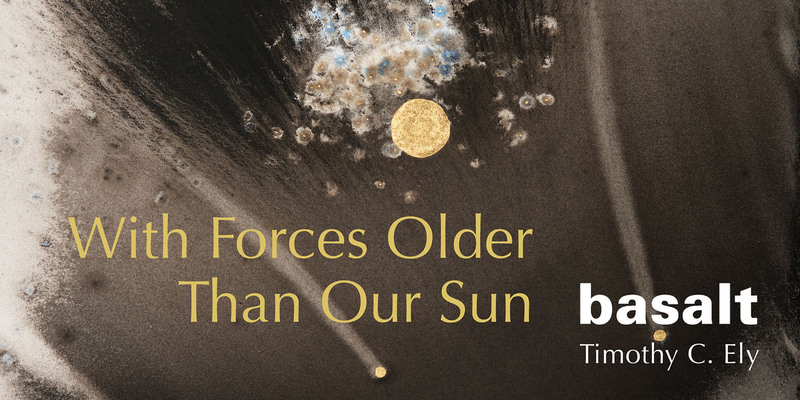 Currently, Ian Boyden is in deep collaboration with forces older than our sun—paintings made with primitive dust of asteroids; books made of nickel-iron meteorites. Examine the captions for the paintings and books illustrated here and you will see that interior to the paintings' messages, there is another action taking place. Forms flow all around him, and, like Jackson Pollock teaching shorthand, Ian Boyden makes tracks and reports back to what he sees. The materials carry an inward meaning. Years ago, when we collaborated on a series of paintings, I spent a week working with him in his studio. This event made me one of the few to observe this man while he works. His methods are a complex and personal choreography. Part of the ecology of an artist's studio involves a call to action. This sheet of paper left for the imagination begins to form a communications line between the material's life within Boyden's mind and the material itself, which are both caught in a set of extremely fluid processes that are as deliberately geological as they are human. 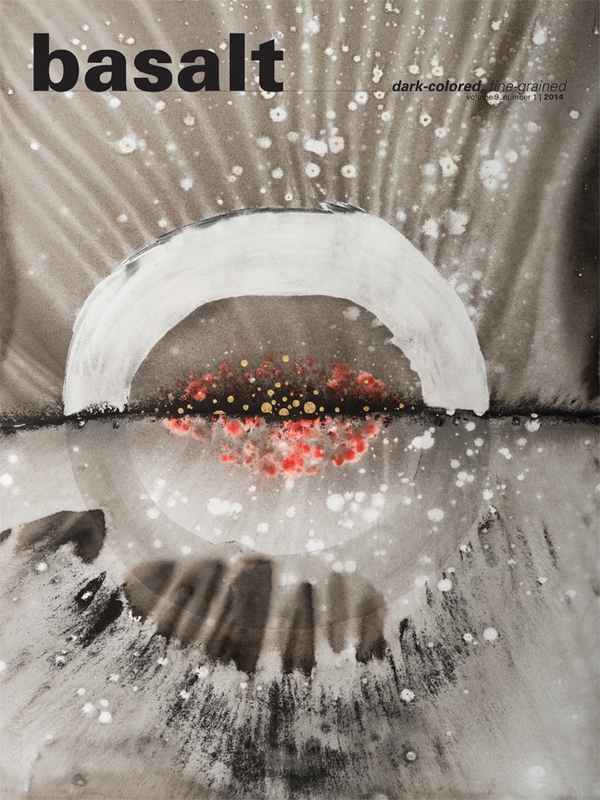 Once the paper is saturated, Boyden allows gravity to move this dynamic black fluid into place. Islands of other pigment surface, the ink responding to these ideas in a language of organic chemistry, surface tension, and capillary action. The painting is pulled from the wall only moments before the paper substrate would collapse, and now is parallel to the horizon. Clearly the earth is in collaboration with this dance. The ink is black, but begins to gray out into a riot of values. The water directs the movement and claws the blackness towards a balance with the white. Then I notice something unusual, a place where not chance but the molecular chemistry of this Boyden-made ink starts to become charged. Fields of polarity appear, like the poles on a bar magnet where both ends are vivid in their differences, and yet give way to nuance of charge in between. A similarity exists in the ink, rendering images that demonstrate the actions of subatomic particles, or the curvature of deep space and time. Whereas physicists investigate invisible levels of perceptions with mathematics and cumbersome machines to describe the theoretical underpinnings of the world, Ian Boyden diagrams these actions with his own hand-made inks. Thirty years ago, a teacher told me a story about when he was studying Islamic calligraphy in Iran. Initially he was introduced to a frilly overkill of text and a morass of ornament and illumination. This is what most of us see as examples of this art. As his progress was noted, he was then shown more refined examples, verse, presented as calligraphy alone without ornamentation, without gold leaf or lapis lazuli. In time he was taken to a secret room, where he was shown what his master considered the finest expression of the calligrapher's art. He presented my teacher with blank sheets of paper. But as he moved in for closer scrutiny, the text revealed itself as the marks of writing with pure water on the surface of the sheet. The greatest statement had nothing to do with legibility, it had to do with process. There is a great lesson in this idea, a simple one which still has much range, and helps us understand Boyden's use of carbon. One doesn't need the full range of visual tools and conceits to make an effective statement, and by peeling away deeply, that which is revealed is very clear and very elegant. It is a whisper during a hurricane. The blackness of the ink provides an axis for contrast. The Japanese word kokushittsū literally means “bucket of black paint.” In Zen Buddhism, kokushittsū refers to the state of darkness, doubt and futility that often occurs prior to a spiritual breakthrough. The Zen student in this condition is abandoning his or her most cherished illusions, but has not yet glimpsed realization. Watching Boyden paint, this state of kokushittsū manifests materially, adopted as a daily practice, perhaps even as a tool of the artist. 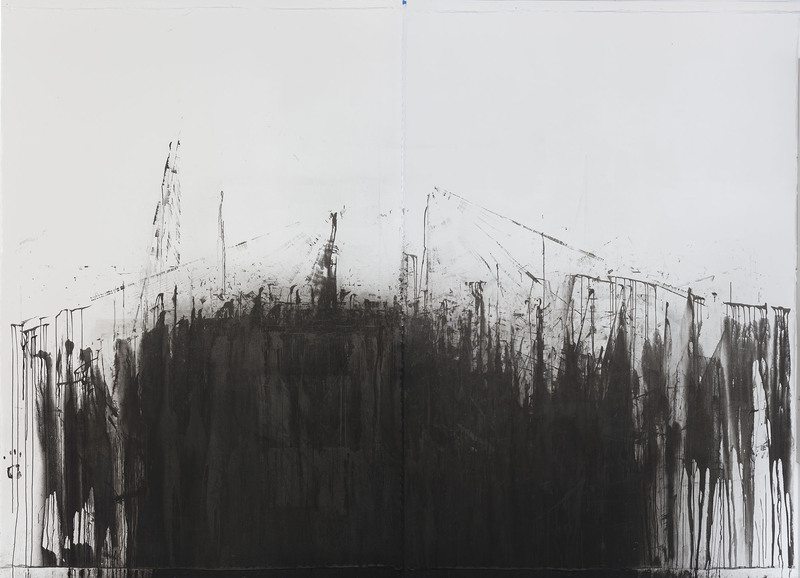 Boyden works with fluid volume, massive quantities, huge mortars of ink go onto the wall and into a sort of telekinetic chaos. In mere minutes, it is all corralled into a sensitive order. In that few seconds before the undifferentiated universe of white paper becomes something else there is a breath, pregnant with potential energy. Art is held in suspension. In all this, it is amazing to watch the transition, as Joseph Campbell so beautifully put it, of “a breakthrough to radiance,” where Boyden connects his ideas to the inspiration of actually painting with stellar material. Stellar activity is explosive, and this change in overall process as well as in expanding his thinking on the overt scale of the work, not in size or scale, but in scope is first rate and establishes new footing for the philosophy of space. Astrophysicists push us to regard scale where the human is diminished to mere life specs in a vast sea of immeasurable void; Boyden brings to us a human scale not depressingly small but in alignment with our sensibilities. By using meteoric materials, he brings to our grasp the richness of this utterly new pigment as well as its associations with very deep space. Not an old masters' material revisited, but as a material for our new century. These paintings made with meteoric carbon share conceptual ground with another set of objects, marvelously unusual books, also utterly original in their conception. The books Field of the Sky (2009), Sidereal Heart (2011), and Lapland Moth (2014) are beautiful machines, precise in their engineering. There is no human language written on these pages. Instead the texts are “revealed” in the crystallization of nickel-iron cooling at a rate of one degree every million years. Boyden is making books from meteorites. With great precision and the dance of design, Boyden works with water jet cutters to form the hinged devices which hold each meteoric leaf wide open for scrutiny. The central axis, a most beautiful spine or dorsal center, offsets the crystal patterns of the nickel-iron folio. They hold to the late Victorian pride of practice that gave us so many examples of cohesive book bindings. The precision of Ian's books doesn't override his expression. I have looked at many rare books with an eye toward cultural history, and at so-called artist books that often have a twisted desire to unhinge book culture. Here are books of novel and extraterrestrial origin, evoking the experience of an encounter of an unusual nature. Here are intelligent expressions, not of books from another world, but of books from the heart of an asteroid. The apparatuses do and do not hold to a tradition of binding while being perfectly tuned to the text. These are books more suited to a science museum than rare book collection, only because astro-science stretches our vision farther and farther. Boyden is a visionary, in part because he is ecologically sensitive when it comes to the ramifications of life/nature and a philosophy of being. This position doesn't take him outside of nature, but demonstrates a fundamental understanding of our being embedded in processes and forces far larger than ourselves. My initial encounter with the first leaves of Field of Sky, polished to a mirror finish, gave me a glance of this, generating a confrontation with our habit of always opening a book with a goal of reading to translate the human inventory of the graspable. Boyden's pages allow a glimpse of the parts of ourselves made of stars. Timothy C. Ely is an artist and writer living in Colfax, Washington.